Make and receive calls the old school way with comfort and safety using the iClassicTM Phone Handset. As cell phones continue to get smaller, our hands remain the same size, making cell phones uncomfortable to hold to your ear. In your home or office, when you may want to have both hands free, you can rest the iClassicTM Phone Handset comfortably between your shoulder and your head like we used to do in the old days (with no fear of possible radiation)! Wouldn’t it be great to bring those days back? The classic look is sure to get attention because it is so cool to look at. 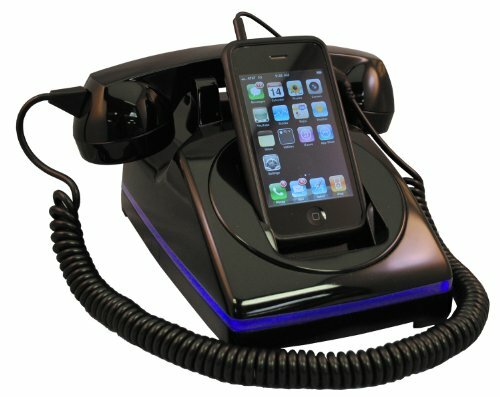 The iClassicTM Phone Docking Station & Handset is a wonderful addition to any home or office. Can You Imagine how cool it would be walking down the street with your cell phone in your pocket and using your iClassicTM Phone Handset to make and receive calls? The iClassicTM Phone Docking Station & Handset is a blast from the past – yesterday’s classic look using today’s technology.